Is there anyone out there who did not try some sort of a diet program during their lifetime? I guess most of us tried “a diet” to either lose weight, to shape up for health reasons, or to fit into that favorite dress, or to impress a special person in our life. Some diets are simpler to follow than others, and some sound better than others, so everyone needs to find one that works the best for them. Of course, it is always wise to first consult with your health care provider, before making that final decision. Dieting is not an easy task to keep up with, but worse yet, what do you do about celebrating a Birthday, and you need a special cake for the occasion. How about a cake for someone on Atkins Diet (high fat and extremely low carbs), which means no sugar and no flour……a couple of main ingredients you always use in making cakes! Google.com to the rescue!! 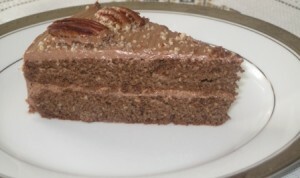 I found a real nice recipe for a Sugar Free Pecan Chocolate Cake, but I was quite skeptical about the outcome of this project….cake without flour or real sugar…only sugar substitutes….??? Would it taste like chocolate flavored cardboard??? Would it be very dense? Would it be very flat??? To make a long story short, the cake turned out great, but since I am not a big advocate of sugar substitutes, I missed the real sugar taste in the frosting. However, as the old saying goes “If you can’t have the original, you have to settle for a copy”. 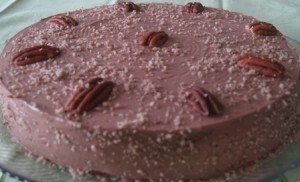 Here is a picture of my cake, and a recipe, in case you would like to experiment on your own. Grease two 8 or 9" round pans. Process pecans in food processor - pulse until they are meal - but they won't get quite as small as corn meal (I used a nut grinder). Add the rest of the dry ingredients and pulse again. Add the wet ingredients and process until well-blended. Pour into pans and bake for 15 minutes, or until toothpick inserted in center comes out clean. Remove from the oven and cool before frosting. Mix all ingredients well, to a spreading consistency, and frost the cake. I am not a person who likes sweets in general however in the past I have been on the Atkins diet myself. I have tasted this recipe personally and I do think it is the best alternative to a real cake for people on a low carb diet. Hey….would you expect anything less from Suburbangrandma, than to use a nut grinder????? The nuts had to be perfect!! !